It is to be hoped that the leaders of other professions and the business world, educators and administrators in this city will follow the example of the Medical Association and inject Moral Re-armament principles into their daily activities, thus reducing greed and self-seeking, and substituting service to the common good in their place. Other people say, 'Sinwenz is promoted by the Communists and it must have something to do with communism. This is also a very short-sighted opinion … [Sinwenz] can be used by the communists as well as any other 'ists.' It is just like a gun which can shoot a good man as well as a bad man. Three or four years ago there were many magazines printed in Shanghai. At that time the famous writers gathered in this place. They wrote splendid articles, novels, short stories, poems and many other types of literature. In the altar of literature there were many arguments about the principles as well as the methods of thinking and writing. The flower of literature seemed quite beautiful and fragrant at that time. But now it faded. Lu-sin Wind 魯迅風, which Huang believes was 'the best magazine that appeared in Shanghai after the Sino-Japanese war had broken out', and Pao Sheng—this writer believes that there has been a precipitate decline in the city's periodical culture since the start of the war. Huang lists 'three classes' of new magazine that have appeared since 1937, those 'managed by youths who are very patriotic and have the most advanced thoughts' (Red Leaves 紅葉 is such magazine); a second kind 'containing translations of foreign magazines, especially those printed in America' (The West Wind 西風 is given as an example); and, thirdly, magazines 'devoted to "pure literature" ' (of which Huang believes Literary Pen 文筆to be the best). The Kuomintang and Communist Party have a common aim to which their efforts are being directed, namely, the salvation of the nation through resistance to Japan and national reconstruction. As long as the welfare of the nation is their common goal no difficulties cannot be overcome… . As long as the Kuomintang and the Communist Party can work in unity, there is no need to worry about the outcome of the war. Both are needed and each supplement the other in the great work of national salvation. If Japan can win a conclusive victory while the rest of the world is in turmoil, that will be a great thing for her. But it has been China's plan—thus far carried out successfully—to prevent this, on the assumption that sooner or later that either Japan would defeat herself (in effect) or others might come in to swing the balance China's way. Recent intensification of the European struggle gives hope to the Chinese that there may be an early settlement elsewhere which will pave the way to a settlement in Asia of the sort tolerable to China. 'While in Europe, one country after another, both great and small, is capitulating before the forces of aggression, it is with quiet confidence that the people of China celebrate the third anniversary of resistance against Japan', reads this week's headline Editorial 'The Third Anniversary'. The editorial recounts a number of recent statements of Chiang Kai-shek, urging resistance to Japan and proclaiming the importance of the Chinese theatre to the European war. It is taken for granted that a novel on Chinese life written in the English language finds its readers among the English speaking people. Knowingly or unknowingly, the novelist is called upon to play the part of an interpreter. The success of such a mission is conditioned by several factors: (1) command of English, (2) a worthy theme, (3) and interesting story, and (4) reading without difficulty. Judging from these standards, "Moment in Peking" is strong in the first three, but rather weak in the last… . "Moment in Peking is a Chinese novel, even though it dons English garments and gives striking resemblance to a translation. It is not strictly comparable to the typical Chinese novel, like the Red Chamber Dream. It belongs to a class of its own—the Chinese novel for foreign readers. A walk around the city is most inspiring to us. All shops post special notices on the door informing the public 'Business As Usual' with only a change of the business hours. I never found a shop which was closed down or suspended the business simply due to fear of being bombed out of existence. The reason, as one of the proprietors informed me, 'such sufferings are only temporary, and after the summer, there is no more,' adding that 'we always look for the future but not for the present.' Such is the 'Chungking Spirit' today! Modern Chinese, as it is known today, may be perfectly modern but decidedly not Chinese. Near-sighted leadership and blind-folded following have reduced the Chinese language, both spoken and written, to the lowest plane of its cultural existence in centuries… . To speak, read and write Chinese properly we have kept the Chinese language free from all foreign influences. Insofar as no English-speaking person is advocating the 'Chinesification' of English, the Chinese Ministry of Education should be heartily congratulated for placing an official ban on the 'Latinization' of the Chinese language. The Editorial 'The End of Far Eastern Appeasement' predicts that the recent reopening of the Burma Highway on 17 October will 'go down in history' as a decisive turning point in the war, 'mark[ing] an end of British appeasement in the Far East and the beginning of Anglo-American cooperation to check Japanese aggression.' The writer discusses aspects of contemporary British and American policy towards China and the mounting pressure in both countries to impose stronger trade embargoes on Japanese goods. In his article 'Appreciation of Art in the Chinese Opera' Hsu Tao-ching 許道經 introduces the fundamental musical principles of Chinese opera, including the various forms of 'meter' (板), and he remarks that 'like many other Chinese fine arts, the Chinese opera is today neglected by many people'. Hsu also discusses the importance of plot and setting in Chinese opera and he does so, like previous discussions of Chinese art forms that have appeared in The China Critic, with the intention of introducing the fundamentals elements of opera to the interested foreign novice. 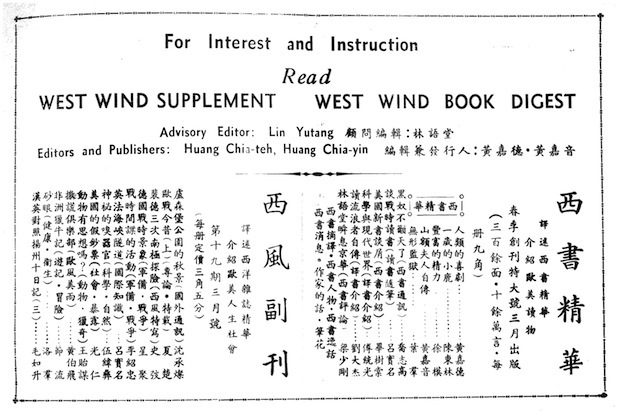 The China Critic suspended publication from 7 November 1940. It did not reappear until August 1945.